Micron Contract Manufacturing Services, Inc.
Ontic Engineering & Manufacturing, Inc.
IMACC Corporation manufactures and reconditions steel drums in three facilities in the United States through its Myers Container division and an injection molding business through two facilities through its IMC Plastics division. After considering all strategic options, including refinancing the business, IMACC's shareholders determined the value maximizing strategy to be a sale to minimize the risk associated with the business. 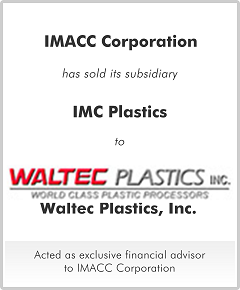 Waltec Plastics was selected as the buyer due to both price and Waltec's synergistic relationships with automotive OEMs that had the potential to significantly increase the business of IMC Plastic's Georgia operation.